It has been less than a week since the New England Patriots defeated the Los Angeles Rams in Super Bowl LIII. Normally, this would be the slow part of the NFL schedule leading up to the start of the new league year next month. That’s until we realize February can bring a bunch of surprising stories and transactions that can’t be announced until the following month. Remember, the Washington Redskins acquired Alex Smith at about this time last year. It’s in this that we give you eight early bold predictions for the 2019 NFL offseason. Not many people outside of New England expected the Patriots to come away with a sixth Super Bowl title under Tom Brady. At the very least, that’s what Brady and Co. would’ve liked us to believe during the playoffs. Even then, there’s some major holes this team needs to fill if it wants to be back on the mountaintop next February. Never afraid to make that bold move, we’re predicting that the Patriots will go out there and use some of their draft capital for a big fish at a position of need. Wide receiver certainly comes to mind here, especially with Cordarrelle Patterson and Chris Hogan set to hit free agency and Josh Gordon’s future in question. Can someone say A.J. Green? If we were to look back to the 2018 NFL Draft, very few teams had three quarterbacks within the top-10 on their big boards. Sure eventual No. 1 pick Baker Mayfield was one of the top overall players, but a project like Josh Allen didn’t seem to be anywhere near that level. When all was said and done, Mayfield, Allen and Josh Rosen all went within the top-10 picks. With months remaining until the 2019 NFL Draft, we can easily project that reigning Heisman winner Kyler Murray and former Ohio State quarterback Dwayne Haskins will be top-10 picks. After that, we’re going to boldly predict that former Missouri standout Drew Lock will be selected before the 11th pick — bringing us to three-plus quarterbacks in the top 10 for the second consecutive year. No, not to the San Francisco 49ers. Recent reports of an off-field situation between Brown and a significant other might impact the 49ers’ willingness to go after Brown after being linked to him over the past several weeks. Having been burnt by the likes of Aldon Smith and Reuben Foster in the past, the 49ers will play it close to the vest here. The same thing can’t be said about San Francisco’s rivals in the NFC West — the Seattle Seahawks. Just ask Frank Clark and others about that. In need of a receiver to go with an aging Doug Baldwin and Tyler Lockett, we’re going to predict that Seattle offers up it first-round pick and change for Brown — something the Steelers can’t turn down given their relationship with the enigmatic receiver. Brown to the Seahawks could be the end game here. Speaking of the above-mentioned 49ers, general manager John Lynch and Co. have not been afraid to make the blockbuster trade. Dealing for Jimmy Garoppolo in October of 2017 is prime example of this. As was trading the second pick in the 2017 NFL draft to the Bears, who ultimately selected Mitchell Trubisky. On the other side of the ledger is a Broncos team in desperate need for that franchise quarterback. 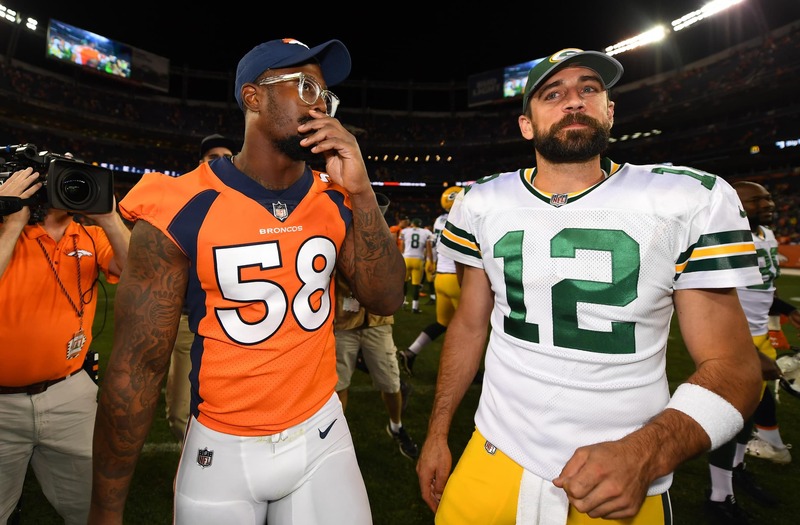 Given Lynch’s relationship with Denver general manager John Elway, we expect the two sides to engage in dialogue about a potential swap that would send the second overall pick and quarterback Nick Mullens to the Broncos for edge pass rusher Von Miller, the 10th overall pick and Denver’s second-round pick. Denver’s new offensive coordinator oversaw an historic start to Mullens‘ career in San Francisco last season. Meanwhile, the Broncos can add either Kyler Murray or Dwayne Haskins with the second selection. Bold. But it could happen. Most reports out of Jersey indicate that the Giants are open to Manning returning as a stopgap starter for the 2019 season. The idea would be to draft a quarterback early in April and have Manning act as his teacher. The question here is whether Manning actually wants to be a bridge for the Giants after what has been a miserable past couple seasons. Clearly in the midst of a rebuild, the two-time Super Bowl champion might want a fresh start to conclude his career. It’s in this that we predict Manning will ultimately land with former Giants head coach Tom Coughlin in Duval. We already know that he controls the Jaguars’ front office. With Blake Bortles already all but gone, the Jags could look to bring in Manning as a bridge for a quarterback they select in April. Unlike the Giants, this would put Eli in a situation of potential contention with a proven team that’s simply coming off a down season. New York gave up three additional second-round picks by moving up for Sam Darnold in last year’s draft. The idea there was to add that franchise quarterback at the cost of further roster building. In the end, this cost Todd Bowles his job. Now working with an offensive-minded coach in Adam Gase, the idea is to add more talent on offense during the 2019 offseason. Void of a second-round pick due to the above-mentioned Darnold trade, we predict that the Jets will move down from No. 3 overall with a quarterback-needy team. Assuming Kyler Murray and/or Dwayne Haskins is available, this would enable New York to add big time draft pick assets to build a strong foundation around Darnold. It would be the complete antithesis of what we saw last spring. And it makes all the sense in the world. Aaron Jones might have performed extremely well in his second season with the Packers — averaging a league-best 5.5 yards per attempt. Though, he’s nowhere near the same proven back as this All-Pro. Having held out the entire 2018 season due to a contract stalemate, Bell is all but certain to leave the Steelers in free agency. If so, there’s no better fit than Green Bay. Imagine him working with Aaron Rodgers under new head coach Matt LaFleur. Packers general manager Brian Gutekunst has gone against the grain of the team’s previous front office head. During his first offseason as GM, Gutekunst actually hit free agency hard with the likes of Mo Wilkerson, Jimmy Graham and Tramon Williams. There’s certainly a chance he looks to add a top name like Bell here. In fact, that’s going to be our early-offseason bold prediction. We rarely see coaches fired after the calendar turns to February. That’s what Black Monday — the first day after the end of the regular season — is for. Even then, there are situations that arise which can lead to a move being made less than a few weeks until the start of free agency. We’re going to boldly predict that happens this February. It could come in the form of the Dallas Cowboys deciding to move on from Jason Garrett. He’s already on the hot seat and will not be calling plays next season. That will responsibility will be left up to young first-time offensive coordinator Kellen Moore. We also know that Jerry Jones has flirted with the possibility of trading for Saints head coach Sean Payton. While that’s unlikely, it shows he’s not as sold on Garrett as he used to be. Jay Gruden (Redskins) and Doug Marrone (Jaguars) are others who could fall into the category of being surprise late-February fires.